We've got something to crow about with this latest adventure from Nosy Crow - the small publisher with wings. This is the second instalment featuring The Grunts. 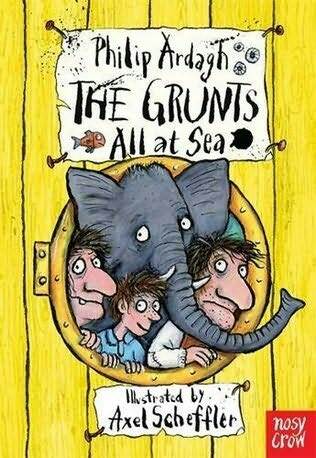 All at Sea is contained in a lovely yellow hardback which has been exquisitely illustrated by one of the best illustrators in town - Axel Scheffler. This book is fantastically peppered in black and white images that are really daft. Each one captivates the reader and lends a whole new imaginative quality to the plot. Philip Ardagh is the wordsmith of this mad cap adventure; his clever word-play and his trademark whit are in abundance. This book is a wonderfully delightful story that will keep you engrossed right until to the very end. Whether you are six or one hundred and six, this book is crying out to be read. It is recommended for readers who love the power of a great story. You will soon romp through this crazy tale packed full of silly and bizarre antics that are totally off the scale. Loaded with irony and total mayhem this is a fun story to read; it will have you laughing on a journey all the way to the sea and back. The Grunts are on a wibbly wobbly mission to get a Person of Great Importance (or POGI) to someone called Mrs Bayliss. Along the way they meet some mysterious villains and some very unlikely heros; each is very imaginatively written and brilliantly characterised. Speedy McGinty is my favourite character. She is a wheelchair-whizzing globe-trotter action type and, in my opinion, makes a refreshing change to other characters that I have been introduced to. I haven't had so much fun and enjoyment reading a book since riding an elephant backwards down the high street in my underpants. So batten down the hatches, run to a bookshop and grab yourself a copy of this book. It will not only make you smile but it will transport you to the far reaches of your imagination. You'll find fun, frolics and a crazy sea adventure ahead . . . . . . in fact what more could you every wish for? Did I mention the Grunts game on iTunes? It is called Beard of Bees and is really quite cool if you'd like to check it out.